Here in Tampa Bay, we get so much lightning that we named our pro hockey team after it. Legend even holds that Tampa meant “sticks of fire” in the language of the Calusa, a Native American tribe who lived near here. Although Tampa Bay sometimes gets called the “Lightning Capital of the World,” there’s a stronger argument for calling us the Lightning Capital of the United States, based on the astounding number of thunderstorms we get every summer. Because of Tampa's unique geography, Florida averages 5 deaths and nearly 20 injuries per year from lightning strikes. Now, we’ve all been told how to protect ourselves from lightning strikes: If you hear thunder, get inside. Get out of the water, get off the golf course. Take shelter. But what if someone actually gets struck by lightning? What then? Picture it: Your friend or family member has just been struck by lightning. What you do in the next few minutes could determine whether they live or die. What are you supposed to do now? Dr. David Wein, medical director of Tampa General Hospital’s Emergency Department, has the answers. Lightning strike victims often end up in the emergency room, so he’s well acquainted with these cases. 1. It’s perfectly safe for you to touch the lightning strike victim. You won’t get shocked or anything. But first, make sure it’s safe to even approach them. 2. Call 911 immediately. Move the victim away from water and metal if you can. There may soon be another lightning strike in the area. Try to get them (and you) to shelter if possible. 3. Assess the injury. Start CPR if necessary. Common injuries from lightning strikes are burns and cardiac arrest. “If they’re awake and talking to you, they don’t need CPR. You should still call 911 and get them to a hospital,” Dr. Wein said. Here’s the thing about CPR: You don’t have be an expert. You don’t have to be certified. Just start CPR. Don’t wait. Don’t hesitate. Step up and do it. Every minute that passes without CPR lessens the victim’s chances of survival. You’ll be doing compressions on the person’s chest to maintain blood flow throughout the body. You don’t have to give any breaths to the patient, and 911 dispatchers can coach you if needed. Shoot for 100-120 compressions per minute, about one every half-second. Keep it up until paramedics arrive. If you get tired, get a person to take over. Seriously, CPR’s life-saving benefits dramatically outweigh any risk of cracking a rib or two. Don’t worry about being sued: You’re legally protected by Florida’s Good Samaritan Act. Just ask these Ohio college students. When one was struck by lightning last year, the other saved his life by performing CPR. 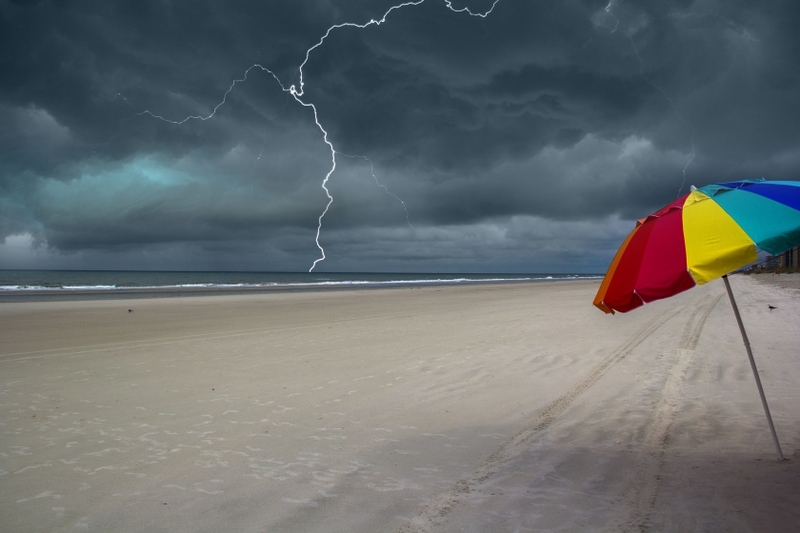 In Clearwater last summer, two teenagers survived being struck by lightning on the beach after a pediatric nurse witnessed the strike and performed CPR on one of the boys until EMS arrived. 4. If the person isn’t responsive, don’t give up. Most lightning strike victims survive. Again, start CPR. Because many lightning strike victims are younger and in better health than most cardiac arrest victims, they have a surprisingly high survival rate if they receive CPR. That’s even true in cases where there are multiple lightning strike victims. A Florida lightning storm is serious stuff, with thunder clouds filling the sky and lightning bolts zapping this way and that. That’s why you shouldn’t rely on the old-time method of determining how far away the lightning is. You know, the method you were told about when you were a kid: When you see the flash of lightning, start counting until you hear the thunder.